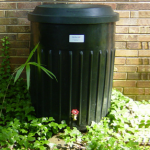 Q: Do I need to do anything to winterize our rain barrels, or is it ok to leave them out? A: The most important thing is to keep water from freezing inside the spigot, or in the pump if you have one. As water freezes it expands, and metal contracts. The result can be a cracked, leaky piece that will need to be replaced. So, number one, use up as much water as you can, and then open the valve all the way to drain out the rest. What water is left below the spigot will freeze, but probably won’t damage a plastic tank. But it is safest not to leave any water to freeze. If you’re moving or emptying the barrel, be careful not to get any of the residue from the bottom of the tank into the valve. Tip the barrel away from the valve and onto its side to dump out the trash. Run clean water backwards through the valve to make sure it’s clear and then leave it open so all the water drains out. 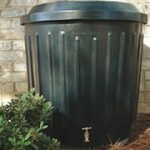 Store the barrel so that water and debris will not accumulate over winter. The next question is do you move the barrel into storage or leave it in place? If you have a dry place to store it, you know it will be safe from freezing. 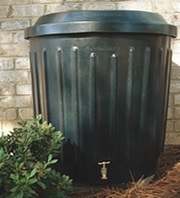 If you want to leave it in place, disconnect the barrel inlet from the down spout, then cover the barrel or switch the diverter so that precipitation doesn’t gather over winter. Many diverters don’t seat tightly, allowing some water to leak into the barrel even in the “off” position. In that case, you’ll want to leave the drain valve open or remove it so water can not collect again, or cover the barrel inlet so the barrel stays empty. Be sure to make provisions to direct the runoff water so it drains away from the house. If you leave the barrel in place, be aware that an empty barrel may be tossed about in high winds. Finally, if you had a pump or hose connected, make sure to drain all the water from these and store them in a dry place.